We love crossover episodes and we're mad about gurrrrl power so we're high fiving The Queen and The River for their upcoming crossover. As you can see, they're both dribbling at the thought of what they're about to do. Turns out Harriet and Lindiwe are good friends, united by their power and desire to see their enemies smacked. Lindiwe sends a Mayday! to Harriet who swoops in to help her take on long-time rival Goliath (Kennedy Stab), who's like the guy who never dies in a horror film. BUT... as we know, no request for help is simple when you're a kingpin. 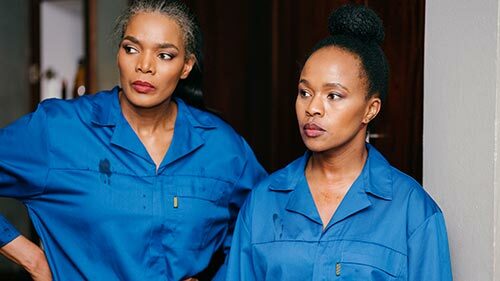 Harriet wants something from Lindiwe and it's gonna be a Big Ask. 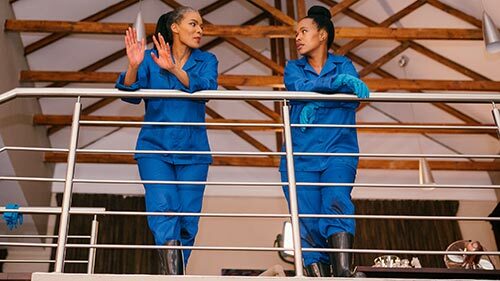 Word from the Mzansi stable of channels is that this crossover is a once-off event - for now. Harriet will be on the show for a week, in three episodes. Surely Lindiwe will also be on The Queen, even if it's once? @jahblessed.. when you say Massive,, I AM THINKING ABOUT COBRIZI .. when he said a word MASSIVE , hahahahah cant wait. @dezi Yip, she will - she's on The Queen on Monday, 10 December. We have no idea how big her appearance will be but that's when she'll be on.